The Australian, 3 September 2001, p.13. 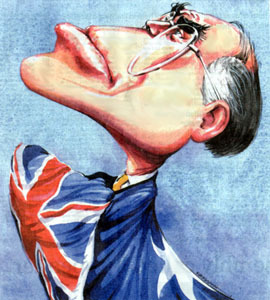 Don′t be misled by John Howard′s flag waving today, for September 3, 2001 is not the centenary of the Australian flag and it was not chosen by the people. Today is merely the centenary of flag design competitions to identify a flag that the world would agree is distinctive and fully representative of all Australians. The British rejected the flag actually used by Australians in 1901. They selected for Australia a flag that was the result of a rigged competition that could only result in a British flag with a Southern Cross. Australians continue to be denied a popular vote on what flag they wish to fly, unlike the choice provided for a national anthem, despite the Howard Government changing the Flags Act to allow such a vote on a new flag and opinion polls showing many Australians want a change. On January 1, 1901 the colonies joined together to create the larger entity called Australia. There was no lowering of the British flag and raising of a new one. The newly federated Australia became one of Queen Victoria′s dominions and the Royal Standard adorned the Federation Pavilion. At 1pm on May 14, 1901 a signal from the Exhibition Building in Melbourne was sent to every school across the continent and 650,000 children participated in flag-raising ceremonies to celebrate the opening of parliament and to demonstrate the Federation slogan of "One People, One Nation, One Destiny". Today it seems an ironic gesture, for Australia did not have an officially recognised flag of its own in 1901 and the flag raised was the Union Jack. The Exhibition Building was again the venue for a flag raising on September 3, 1901 with the announcement of winners of a design competition. While this is claimed to be the birthplace of the current Australian flag, it represents neither the original source of the flag nor the date of its adoption as the Australian national flag. The Australian flag is essentially only a slight modification of the Victorian colonial flag of 1870 and the competition-winning design was not adopted for the exclusive use by the government until 1903. The federal government did not agree to adopt the competition-winning design as the Australian flag - it left the decision to the British authorities. Prime minister Edmund Barton waited until February 8, 1902 to dispatch two flag designs to the secretary of state for the colonies. The design marked "A" was an altered version of the competition-winning design and design "B" was the flag then known as the "Australian Ensign", which had served as a central focus of the federation movement. The Australian Ensign had been used as early as 1832 and the Australasian Federation League, founded by Barton in 1893, had adopted it. With its white field proudly bearing the stars of the Southern Cross on a blue cross, the Australian Ensign was effectively Australia′s national flag in the years leading up to Federation. The official invitations to the Federation ceremonies and the inaugural celebrations themselves prominently featured the Australian Ensign. The British authorities rejected the Australian Ensign, even with its prominent Union Jack, probably because in 1884 the British Admiralty had banned its use by Australian ships. The competition-winning design was acceptable to the British as it broadly conformed to the pattern of British shipping ensigns - with a colonial badge of the Southern Cross and an extra symbol - a large star with six points to represent the federation of the six colonies. The federal government was given permission to adopt the flag, which it did on February 20, 1903. For many years however, the general public were only permitted to use the red version of the Australian flag, with the blue version restricted to government use until March 15, 1941 when prime minister Bob Menzies gave permission for all Australians to use the current flag. The current flag was not officially adopted as the Australian national flag until April 14, 1954 when the Flags Act came into effect. Public support for a new flag continues to be at a high level, not because Australians don′t respect the flag, with its 19th-century design, but because in the 21st century, Australia can do much better. There can be no argument advanced, even by those who wish to retain the Union Jack, against the fact that Australia has ceased to be a colony of Great Britain. The Australian flag can never proclaim our identity while it contains the flag of another nation in the position of dominance. The present design has served its purpose but is now inadequate, divisive and demonstrably colonial.